The old Red & Black offices at the University of Georgia were wonderful. They certainly weren’t state of the art — no, you had to climb up squeaky stairs just above the coffee shop that chimneyed up wonderful fumes on Sunday mornings, and there were times you felt like the floors below you could collapse at any moment, which totally would have screwed us for deadline — but they were the perfect offices for a bunch of cocky, green college newspapermen and newspaperwomen. I remember the dusty old couch in the room where the daily story budget meetings were held. I remember looking across the street at Toppers, one of the two local strip clubs in Athens. I remember the concert flyers, the stickers, the inside jokes that were plastered on all the walls. This was a college bar without the booze, a shrine to the Athens of yesterday made by the journalists of today so that when they took their future jobs they could remember the past and smile. And there was the best wall art of all. 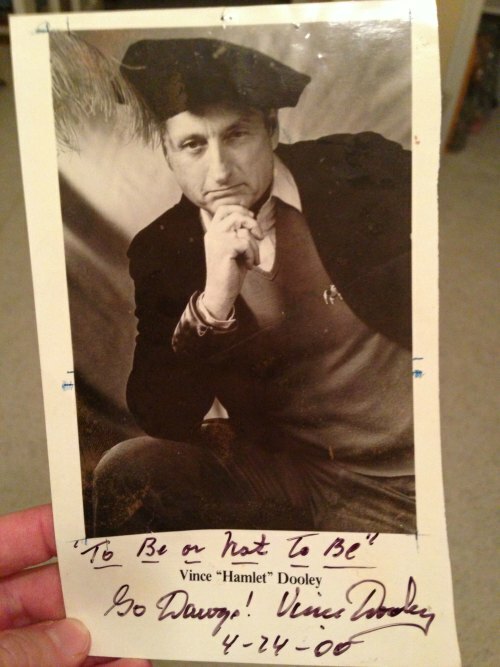 It was a photo of Georgia’s legendary coach Vince Dooley, wearing a hat with a feather in it, posing like a stage actor eager to tackle hours of Shakespearean iambic pentameter. That photo hung on the wall in the sports department, next to the Mac computer that barely connected us with working e-mail in the late 1990s. He looked at it, laughed, and claimed he didn’t remember posing for it. I believed him, though I also found it hard to believe. That, I’m sure, is the last time we spoke. I was reminded of that photo when I read Tanya Sichynsky’s nice piece on Dooley for the R&B as he was set to be honored for the 50th anniversary of his first season in Athens. So, I went and found it. It, of course, is still glorious. After I left the interview, that photo somehow never made it back to the newspaper offices. It never retook its place on the wall along with the old REM stickers and the Asa Nisi Masa concert flyers. Because after I left Dooley’s office, with the signature of a legend and a personalization to boot, I took it home with me. That piece of wall in the sports department of the old Red & Black would remain bare. And much like Dooley himself, that spot was never again filled by anything quite as grand. In my mind’s eye, I think I’m OK with that. 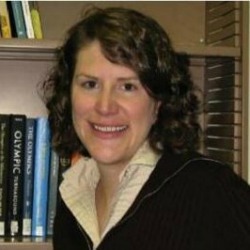 My former colleague at the Red & Black student newspaper, Amber Roessner is now a professor of media history at the University of Tennessee, and she’s written a fascinating book, “Inventing Baseball Heroes: Ty Cobb, Christy Mathewson, and the Sporting Press in America”. In our chat, we talk about the future of our industry and how she as a teacher is optimistic about what’s to come, how newspapers played a role in the making of baseball heroes in the early 20th century, and why the relationship between ballplayers and sports writers back then was so chummy. Plus, we talk about why I’m annoyed by the attitude of long-ago sports writers about protecting the athletes they covered, and we listen to Roessner squirm when I ask her whether those writers were actually any good. My first-ever podcast was with Cincinnati Enquirer Reds writer C. Trent Rosecrans. We talked plenty of baseball that day. After an interesting chat with Cheryl Haggard last week, we check in with Now I Lay Me Down To Sleep co-founder and photographer Sandy Puc. 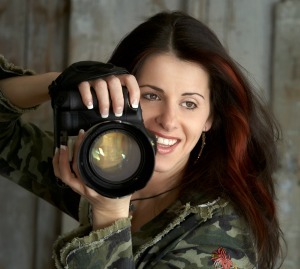 We get her perspective on why the duo started the foundation, what it was like photographing Cheryl’s son before and after he died, how the thousands of NILMDTS photographers approach each session, and how they proceed through their workn. It’s yet another emotional chat, but it’s also a fantastic talk. Plus, on a lighter note, we talk about why Sandy decided to get married via an Elvis impersonator and how and why she travels eight months a year, much of the time with her children. We’re taking a different tone the next two weeks as we talk to the two co-founders of Now I Lay Me Down To Sleep, an organization that provides the gift of remembrance photography for parents suffering the loss of a baby. 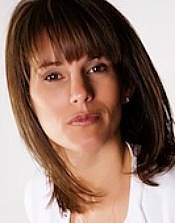 The first guest this week is Cheryl Haggard, who wrote this beautiful piece after her son, Maddux, died. During our chat, we talk about how the loss of her child spurred her to help start this organization, how those photos have brought hope to her future and honor to her child, and the perception problem the organization faces in regards to postmortem photography. Plus, we talk about how a photographer approaches a session with a family who’s suffering a loss and if society is becoming more accepting of this kind of photography.